Sold to Butchers and Barbecue Houses in Southern California. 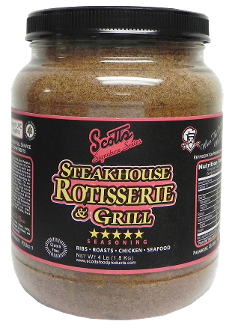 It is used as their own secret seasoning for Chicken, Ribs, and Roasts. Try our own special recipe for Steakhouse Potatoes. In a skillet, saute thinly sliced onions in butter. Alternate layers of sliced white rose potatoes, pats of butter and Steakhouse Grill Seasoning. Cover and simmer while turning occasionally. FABULOUS!! !